Energy use is the biggest cause of climate change, and it’s the first place to enact meaningful strategies to lower greenhouse emissions. It’s also a smart angle for talking about climate change, because it’s easy to find agreement on issues like improving energy efficiency, reducing pollution, cleaning up our energy supply, and reducing reliance on unstable foreign supplies. But energy can be a bit of a double-edged sword. The very reason that some people reject climate change is that they fear some of its solutions, such as regulations on carbon, or government subsidies for clean energy, pose risks to established fossil-fuel based ways of life. The good news is that it’s not hard to have positive conversations about energy. In doing so, one can leverage key strategies from previous articles in this series. For example, why not instill optimism by reminding people that Americans are proven innovators and problem-solvers, or by pointing out how America ought not get beat out by other nations in the global race toward modernizing the energy system? By emphasizing shared values, you can structure a dialogue around areas of mutual agreement. The following are some common misconceptions and myths about renewable energy, along with a fact check, and a rebuttal designed to be inclusive and broadly appealing. The overall costs of electricity generation from different sources can be compared using a measure called the levelized cost of electricity. The Energy Information Administration and Lazard financial analysts are two reliable sources for a deep dive on electricity costs. Similar, but easier-to-read information can be found in a summary at Scientific American, or these infographics from Lazard. Either route leads to the same conclusions: The price of renewables has fallen to the point that they are cheaper than conventional fossil fuels. Onshore wind turbines and utility-scale photovoltaic solar are essentially tied for the lowest cost of unsubsidized electricity for new power generation. Natural gas is not far behind, and the variation in prices between those three will likely depend on geographic location. Add in tax credits for renewable energy, or the potential for carbon pricing, and the price tags of wind and solar look even better. A friendly response: “I completely agree with you that the price of energy is important. High energy prices affect us all, every day. That’s why it’s such good news that renewable energy sources have fallen in price and are now cheaper than, or similar to, the price for conventional power plants. On-shore wind turbines and large-scale solar power are among the cheapest sources of energy today, and that’s not even considering subsidies, tax credits, or the potential costs of carbon pricing. Add in those factors, and the price of renewables is even more attractive. This myth doesn’t pass the smell test. If wind turbines were a net loss on their energy footprint, no one would build them because they’d be uneconomical. But as the response to the previous myth shows, wind energy is a winner when considering the total life cycle costs of construction and maintenance. All types of energy infrastructure require energy to build. The ratio of energy generated compared to the energy sunk into the process is called the energy return on investment, or EROI. A 2010 study of wind turbines around the world shows that wind turbines generate 20-25 times the amount of energy that goes into making them; and a 2014 report pegs the EROI for wind at 18-20. The difference in numbers reflects variations in turbine design, site design, and the energy generated in different locations. How does wind compare to other forms of electricity? Coal comes in at around 18, while natural gas falls somewhere in the range of 7 to 15. Although fossil fuels are energy-dense, considerable energy goes into transporting them via rail or pipeline. When fossil fuels are burned to generate electricity, 30 to 45% of the energy is lost as wasted heat. This further reduces the overall energy return of fossil fuels. An article at Carbon Brief offers a summary of the energy required to generate electricity from various sources. The math may be tricky, but there’s no question that wind turbines clearly generate far more energy than it takes to build them. And that’s one good reason that wind energy is growing rapidly, worldwide. Myth: We could die without coal. Renewable energy is not reliable. What happens when the Sun doesn’t shine, or the wind stops blowing? I guess we all just sit in the dark? Storage of renewable energy is a hot topic in energy research. While wind farms and solar arrays are scaling up worldwide, we also need to become better at storing energy so that it’s available on-demand. Turning the intermittency of wind and solar into the ‘baseload’ energy required by the grid is an engineering challenge that offers enormous reward to those that solve it. So there is vigorous competition to optimize energy storage. While traditional batteries are one option, there are other ways to store energy. A particularly elegant solution is pumped hydro, which uses surplus wind energy to pump water uphill. When energy is needed, the water is released and allowed to flow downhill, spinning turbines along the way. One advantage of pumped hydro is that it can respond nearly instantly to the ebbs and flows of energy demands across the grid. While all forms of energy storage result in some loss of energy (damn you, thermodynamics), pumped hydro is among the most efficient. Concentrating solar power, also called solar thermal, uses mirrors to concentrate the Sun’s energy. Thermal energy can be stored in molten salt, which has an exceptional ability to absorb and retain heat, and can be used to spin steam-powered turbines 24 hours a day. Until recently, concentrating solar power was expensive, but in 2017, the price dropped precipitously, as new plants under construction in Dubai, Australia, and Chile each set new records for the cheapest electricity price in the world. The Chilean plant is being constructed in the relentlessly sunny Atacama Desert, where it will soon bring 24/7 solar energy to Chile’s mining industry. Technologies like batteries, pumped hydro, and concentrating solar power are advancing rapidly, in part because there are tremendous financial incentives to develop low-carbon, baseload energy sources. It would be unwise to assume the solutions we have on hand today will remain static over the coming decade. The innovation spurred by energy storage technology makes an appealing rallying point: a great America is a competitive America. Regrettably, partisan politics (with some significant help from dark money) has made clean energy into a topic that is often mischaracterized and poorly understood. Fortunately, though, there are many ways to clear the air and build support for clean energy, using ideals that practically all Americans hold dear. Australia appears to be making considerable progress with solar power wind power, and pumped hydro. Pumped hydro shemes planned and under construction here. Large scale solar "farms" are often built over fields and forests- resulting in a loss of carbon sequestration and oxygen production and widlife habitat as shown in a video I did of one built close to my home- which doesn't mean I'm a NIMBY because I don't like them anywhere: https://vimeo.com/260469370. Also not counted is the cost to dispose of the at least somewhat toxic panels when the "farm" is terminated. Also not counted is the carbon emissions to ship the panels across the planet from China (how about toxins emitted to make the panels in China), then to truck them to the site from some port- and huge carbon emissions needed to build them- at least this one as you'll notice all the huge machines that were needed. So, maybe there still a good thing- but not counting such externalities is NOT smart. "A particularly elegant solution is pumped hydro, which uses surplus wind energy to pump water uphill." Sounds good, but here in Massachusetts- there is a big battle going on over the only such pumped hydro facility. Those critics are against all fossil fuels, against pumped storage, want to stop all tree cutting, against nuclear- and though many are in favor of solar and wind- they will never respond to my critiques of large scale wind and solar "farms" (note my previous post here), they will not respond to my questions as to how will we get by without wood as a low carbon footprint raw material if they lock up all the forests- and amazingly, many who are even all of the above are even against wind and solar! In the local paper this morning I see an editorial by a guy who says we should all get off the grid, use outhouses, and pump water by hand. It doesn't seem to me that we can solve problems by being against every option. I recall that President Obama suggested we need to use all forms of energy, wisely of course. JoeZ, lifecycle carbon footprint of solar and wind most certainly are considered, and they are drastically lower than the footprints of non-renewables. Tom, here in Massachusetts, such lifecycle for solar and wind are apparently NOT considered. They probably are among some scientists- but not among the politicians who determine policy and write laws. Currently, solar is popular in this state but the total production of solar is still very small. State law will requre far more and much of this will be on solar "farms"- which as I note, have drawbacks that are NOT looked at here. I'm not aware that anyone has actually counted the loss of carbon sequestration and oxygen production of a solar farm. The one near my 'hood was once a gravel pit but half of it had grown back to forest. So, that forest had to be destroyed. Nobody counted the loss of carbon sequestration and they also didn't count the fact that all of that wood went a biomass plant. The irony is that forestry critics in Mass. hate biomass- yet their beloved solar farm sent a great deal of wood to a biomass plant. Now, the fact is that forestry is renewable. But here in Mass. we've had and still have a war over biomass. Many critics really do want to lock up all the forests and they really don't respond to questions as to the consequences of that. Let's face it- all these issues are extremely complicated. Nobody has all the answers. There is no magic bullet- though long term I think it will be fusion. Since this web site is about skepticism- it might be nice if those who really do think it's all about fossil fuels to just try to be a bit skeptical- the way lawyers are taught to argue either side of the case. It might be worth the mental exercise. [DB] Thank you for taking the time to share with us. Skeptical Science is a user forum wherein the science of climate change can be discussed from the standpoint of the science itself. Ideology and politics get checked at the keyboard. Very strawman article. I have never heard any one make those extreme statements in your "myths" section. There are however real scientific derived questions as to the math surrounding so called "renewables" or "clean energy". Bottom line everything we do involves releasing polution and the solution is never dilution. We simply need to stop. "I have never heard any one make those extreme statements in your "myths" section"
And yet I see those and more strewn every day. "There are however real scientific derived questions as to the math surrounding so called "renewables" or "clean energy""
Then you'll have no difficulty in citing those "real scientific derived questions". Pelase do so. "building and running new renewable energy is now cheaper than just running existing coal and nuclear plants"
"the full-lifecycle costs of building and operating renewables-based projects have dropped below the operating costs alone of conventional generation technologies such as coal or nuclear"
"its cheaper to tear down three-quarters of American coal plants and replace them with renewables than to let them continue operating"
Nuclear and coal, and other "baseload" power sources have the opposite problem associated with renewables. They generate too much power at night so much of their capacity is wasted. Many people are not aware that most of the existing pumped hydro was built in the 60's and 70's as a method to store excess nuclear power at night for use during peak power during the day. In France they shut down many of their nuclear plants on the weekend. Since the cost of nuclear facilities is so high, it is very expensive to shut down facilities for any reason. When people ask about storage of renewable energy, it is interesting to ask about storage of excess baseload for use during peak power. "Large scale solar "farms" are often built over fields and forests- resulting in a loss of carbon sequestration and oxygen production and widlife habitat as shown in a video I did of one built close to my home-"
In America forests cover 33% of the land, which is 300 millon hectares of land. Its been calculated that if solar power provided all of Americas electricity it would cover approximately 2.5 million hectares of land so less than 1% of the land covered by forests. In reality America will use a mix of energy sources, so it will be something less than 0.25%. I don't see that this small number is a significant or unacceptable loss of forests (or fields). We waste enormous quantities of food and timber each year. Reduce that by just a faction and it would compensate for land used for solar panels. Jef @6, what is it you are proposing? Are you saying people should just stop using all or most electricity? How realistic do you think such a proposal would be? '[PS] Fixed image. Please read comment policy for details of image. You must restrict image to max width of 450px using the "appearance" tab of the image inserter. Well 2 biggies for energy efficiency are electrification of transport (60% of energy going to wheels cf 20% for petroleum-based) (ref), and solar PV for electricity generation instead of coal and gas. While replacement will take a while, that means all the more urgency for serious effort now. Some interesting ideas on electricity efficiency scattered through this list from the Project Drawdown people. There is a lot of potential, but the average family still faces obvious constraints. I think it's unlikely people would drastically reduce electricity use so that they go cold, or go without air conditioning. I would suggest most people apart from the rich already try to keep electricity bills as low as possible. Big gains can be made with adding double or triple glazing, extra wall insulation, heat pumps etc: but they cost money. Tax incentives might help. I think the bottom line is it's hard to avoid the need for a big build out of renewable electricity generation as fast as possible. And it is possible technically and economcially, its a case of whether there is the will do do it. An Implicit but never stated "Incorrect Myth" regarding renewable energy is: "Future generations of humanity can continue to benefit from non-renewable energy, particularly the burning of fossil fuels." The reality is that future generations cannot continue to benefit from non-renewable energy sources'. And there is no way to claim they can. The benefit is obtained by their predecessors. The future generations get no sustainable benefit from the activity being done by their predecessors. All that the future generations get are harmful impacts, many of which cannot be undone no matter how brilliant people in the future are, and reduced amounts of non-renewable resources. I think that Project Drawdown list needs to be revamped. Offshore wind energy can play a much bigger role today. There are turbines now which produce 20-40 times the electricity than an onshore wind turbine. French nuclear has an overall capacity factor of 75%. Not much more than offshore wind. Whereby, when a nuke has in incident you're loosing a gigawatt or more in just a few seconds. Meanwhile, wind is predictable for many hours in advance and the grid can easily be adjusted accordingly. We agree. Nuclear requires at least a gigawatt of spinning reserve at all times in case of an incident as you describe. These incidents happen about once every two years in the USA. For renewables the biggest incident is losing a transmission line which can be countered with an adequate grid. In your comparison of wind and nuclear you did not consider the opportunity cost of nuclear versus wind. Jacobson 2009 (cited over 1200 times) calculates opportunity cost of various plants. Because of the very long lead times to build a nuclear plant much more fossil power is generated during the building of the plant compared to a renewable plant. For example, let us imagine you want to build a 1 megawatt (delivered power) wind energy plant. It takes about 2 years to get approval and 2 years to build. Then you get your energy. If I want to builld a nuclear plant it takes 5 years to get approval and about 10 years to build. Your wind plant has been generating power 11 years before my plant is comissioned. That 11 years of missed power has to be supplied by fossil fuel plants until the nuclear plant is finished. This makes nuclear a very high emitter of CO2 compared to renewable plants which are much faster to build (and produce partial power when partly completed). Many analysis of nuclear leave out the opportunity cost CO2. There is another aspect to the wind farm argument. Let's assume, for the sake of the argument, that a wind turbine only returns an amount of energy equal to what is used in it's construction before it has to be replaced. (not true but bear with me). The country where you are building these turbines creates all it's energy from fossil fuel. You build wind turbines sufficient to generage 10% of the nations electricity, replacing that amount of coal. Now the next tranch of wind turbines are build with 90% fossil fuel energy and 10% renewable energy. you see where this is going. We eventually get to a point where the wind turbines are being made entirly with renewable energy. Since, in fact, wind turbines return far more energy that is needed in their manufacture, the argument is far stronger. Thanks for the two responses above. Another aspect of nuclear is its long lasting legacy. We’re arrogant enough to claim that we could manage a toxic waste problem which is radiating for hundreds of thousands of years. A Google search for “Asse Germany radioactive waste catastrophe” will tell you the story about a nuclear repository which in the 1980s was alleged to be “safe for hundreds of thousands of years”, but ground water started leaking into this old salt mine just a few years later. Nobody knows now what to do. And we're not even talking about high level radioactive waste with significant heat generation. Recovering the 120,000 barrels seems to be too expensive if not impossible. German engineering suffering borderline. A legacy for many generations to come. LEVELIZED cost estimates can be used as a starting point for estimating the cost of electricity service which society currently expects. Electricity users expect reliable service. In TX, the full cost (capital related charges + operating costs) of reliable electricity structured around wind turbines is at least 1.75x the full cost of reliable electricity generated by natural gas fired combined cycle combustion turbines. In New England, the multiplier is 2x. The multipliers were estimated using EIA levelized cost estimates, wind turbine capacity factors for both regions, hourly wind power data for both regions plus a simple financial model. The wind turbine package was designed to generate a constant amount of electricity, for simplicity's sake. "Package" means the mix of thermal generators backing up wind turbines. The multipliers are intended to be ball park estimates. PREDICTABILITY of wind turbine output: Day ahead and longer wind power forecasts leave much to be desired across North America. Your attention is directed to https://www.aeso.ca/grid/forecasting/wind-power-forecasting/ . Go to the "Monthly Wind Power Forecast vs Actual Comparison". "aeso" is the Alberta System Operator. Results are similar for Electric Reliability Council of Texas and ISO New England. I note that you show no math or citations to support your wild claims. I have seen several attempts by wind opponents to calculate very high costs of wind using absurd assumptions like you describe. About 5 years ago one was published in a journal. No-one refers to that article now because everyone informed knows that it was BS from the start. In spite of these calculations, in Texas and New England wind energy underbids all fossil fuels including gas. Real world experience indicates that wind is cheaper than all fossil fuels. ps: I thought that the 6 day in advance estimates of wind energy were pretty good. Since utilities use these for routine planning if a fossil plant that is on standby is forecast to be needed 6 days in advance they have sufficient time to get the fossil plant online. The one day (or one hur) forecasts are the ones that control what is done in the end. Everyone knows that forecasts are not as accurate beyond 4 days. Claiming a 6 day forecast is important is a strawman argument. Not to mention the advances in grid-scale storage that are coming on line. FF plants arent the only backup available. Pls do not misconstrue my delayed replied to your comments as a lack of interest. Regrettably, because skepticalscience's insights are appreciated, I can read the website only 1x or 2x per week. To reply sooner rather than later to your comments, I will do so in a series of replies. Mr. Sweet, we will have to agree to disagree about the quality of Alberta's day ahead wind power forecasts. Reality is routinely outside forecast range. Reality is outside the range even though the high end of the forecast range is typically 4x the low end of the range. Broken clocks forecast better than that. On the other hand, day ahead forecasts predict well the direction of change. That can help guide decisions about preparing reserves for use. 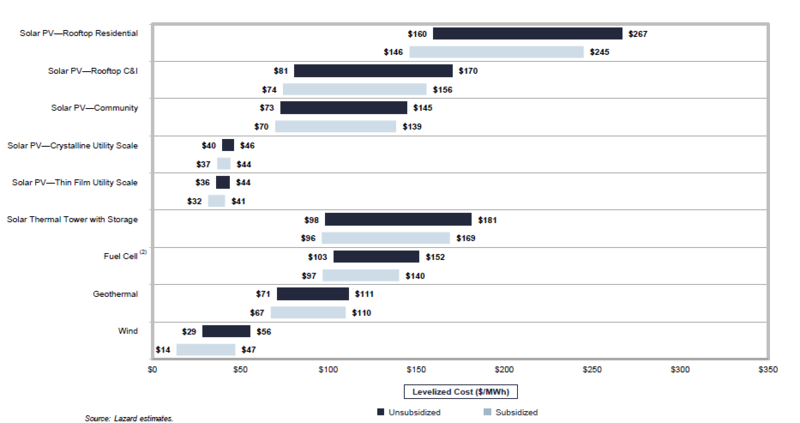 I'm a bit skeptical about *unsubsidized* renewable being cheaper than fossil . If it is , then the market would take care of switching everyone towards renewable without the need for CO2 emission controls, or a carbon tax. In other words why haven't energy companies switched to renewable en masse already to maximize their profits if renewable was cheaper. Turco @28 , these are certainly difficult matters to make judgment about. For starters : a perfect market is not in existence. Additionally, there are many externalities which are difficult or impossible to put a dollar cost on. Long-term levelized costs might point to a particular line of action as being cost-effective ~ but the short-term changeover costs may act as an immediate deterrent to the shareholders of private companies, and especially to the directors/executives who may temporarily lose much of their bonuses/benefits. Strangely, most directors/executives would prefer to receive generous monies into their own pockets now, than have the benefits go into the pockets of their successors. It is simply human nature to be more selfish than saintly. Future hospital & other health costs (from coal-related particulates, etc) generally get little or no consideration at the boardroom table. And future social and political ructions do similarly receive no real consideration. And there is presently a rather elastic limit to the amount & speed of introduction of renewables : at least until such time as cheap bulk energy storage is widely available (another example of more foot-dragging by companies & governments). Then there is the matter of "invisible subsidies" to renewables ~ and also "invisible subsidies" to legacy coal/oil/gas industries (sunk-cost subsidies, and present & future subsidies through physical & social subsidies/infrastructure). Ah, if only life were simpler ! Michael Sweet challenged my 3 April post’s main point: The full cost of RELIABLE electricity service structured around wind turbines SIGNIFICANTLY EXCEEDS the full cost of reliable service based on a combined cycle natural gas turbine (CCGT). This post begins the process of supporting the statement. At least one more post will be needed to complete the process. RELIABLE is a key word in the initial post. Reliable service has for decades been characteristic of Australia, New Zealand, Japan, Korea, Taiwan, North America, Europe and elsewhere. Thus, globally, electricity users are now accustomed to getting all the electricity they want when they want. Lights glow when switched on, and stay on until switched off. Personal devices, laptop computers, Teslas and other battery operated items get charged when needed. Stop lights function full time, and electric trains run on schedule. Refrigerators and freezer s work round the clock. Meals are cooked when needed. Stores are open, fully illuminated and operational when shoppers visit (ditto schools, hospitals and bureaucracies). Work schedules are regular, and one puts in a full day every day. Whereas society is accustomed to reliable electricity, wind turbines generate unreliable electricity. Their output is intermittent, variable and unpredictable. And, other traits can differ from electricity produced by conventional generators. How unreliable is wind electricity? In Texas, the wind turbine capacity factor routinely fluctuates FIVEFOLD during 24 hour periods. Fivefold means the highest capacity factor is 5x the lowest. For example, the capacity factor was 63.7% at 4 a.m. (an off peak time) on 31 Dec 2018 and 12.1% at 5 p.m. (a peak demand time) 30 Dec. . More than one quarter of the time, the capacity factor is less than 20%. One quarter is equivalent to 6 hours per day. The 6 hours tend to occur during business hours—when electricity demand is strong. Each year, seasonal forces reduce the capacity factor 35% while concurrently raising demand 45%. For the source data, go to the “Hourly Aggregated Wind Output” entry on www.ercot.com/gridinfo/generation. For the benefit of readers not familiar with industry jargon, capacity factor is a measure of utilization. When generation equals rated capacity, the capacity factor equals 100%. A 50% capacity factor indicates rated capacity is half utilized. 10% indicates one tenth. Because wind turbine output is erratic and frequently mismatched with electricity demand, wind turbines must be supplemented with additional equipment so society gets reliable electricity service. The additional equipment adds capital and operating costs to the system, thereby raising the full cost of service. Actual experience and data suggest the cost of reliable electricity correlates with wind & solar’s combined share of electricity supplies. In Europe, electricity rates are highest in the two countries most dependent on renewables. The two countries are Denmark and Germany. Furthermore, rates rose more in Denmark and Germany than elsewhere in Europe while these two countries installed the bulk of their wind capacity. In Australia, rates are highest and rose fastest in the state most dependent on wind & solar (South Australia). Germany, Denmark and South Australia have the highest electricity rates in the WORLD (source: https://www.afr.com/news/australian-households-pay-highest-power-prices-in-world-20170804-gxp58a ). In the United States, electricity rates in the top 10 wind producing states as a group ROSE 7x faster than the U.S. average. The comparison period is 2008-2013 (source: https://www.forbes.com/sites/jamestaylor/2014/10/17/electricity-prices-soaring-in-top-10-wind-power-states/#70c08fbe6112 ). The conflict between experience and claims about the cost of wind electricity prompted me to look into estimates of wind turbine costs. Insights will follow in a future post. whereas James Taylor is a Heartland misinformer. By all means do an analysis but please get your information from a reliable source. Ie, do your work in google scholar. For Texas, I do seem some interesting analysis on wind. eg here, and similar conclusion for Germany here and for Italy here. I agree that externalities for fossil fuels are higher and add to the total societal cost . But I was referring to dollar costs as experienced by companies and consumers today without a Carbon tax. I still think if renewables are really cheaper, business would jump at the opportunity . If it is an issue of sunk costs, we should see a slow replacement of old fossil based power plants with renewables ( why fix an aging powerplant if a new wind/solar farm produces cheaper electricity). If it is an issue of stubborn CEOs , other companies and venture capitalists can move in and compete with them . Yes , the market is not perfect , but competition generally wins in the end . I do not know why renewable is not yet cheaper (after all wind and sunshine are free whereas oil is not ). Thinking man is arguing that the inability to store power ( which you mentioned also in your post ) is the big technological bottleneck. Well for a lot of the industry, renewables are what businesses are jumping on but if you look at the graph in the article, you see the margin between gas and renewables is very narrow - much more so than gap between renewables and coal/nuclear. A carbon tax would shift that. Depending on actual location, just removing subsidies on fossil fuel would shift the economics. US spent $20B on FF subsidies in 2015/16 according to this. Storage is an issue but it depends on what the whole network looks like in terms of energy sources. Here we have a lot of hydro. Just holding back water when wind generating plenty is a form a storage. Tesla's battery plus windfarm has been a huge success in Australia. This article reports on further advances with 12 storage projects in the pipeline. Grid-scale storage is already here. And yet, as I pointed out before, wind and solar underbid fossil fuels and nuclear. Newbuild wind and solar are cheaper than just running coal and nuclear power plants. New gas is more expensive than new wind and solar. Scaddenp has demonstrated that when wind is built the cost of electricity goes down. Your point about Germany is interesting. 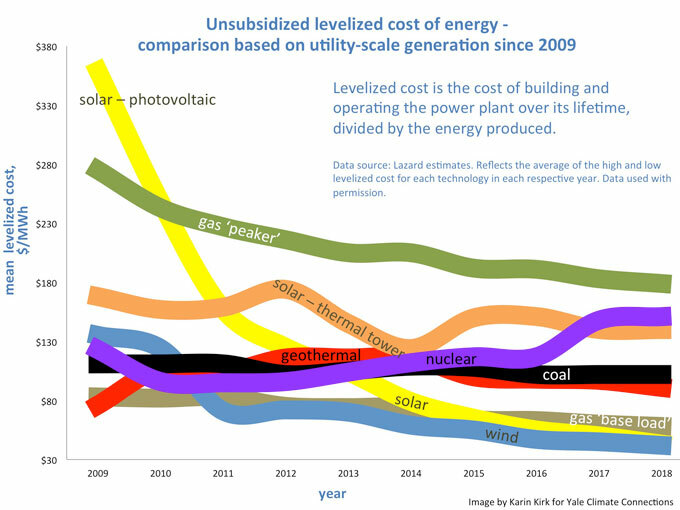 I was not aware that we were discussing what wind and solar used to cost, I thought we were discussing what it costs to build wind and solar today. Wind and solar are much cheaper today than they were 5-10 years ago. Yesterday I was looking at the cost of a solar system for a boat. The cost of the panels was astonishing it was so low. I purchased a similar system 25 years ago and the panels were most of the cost. Today the panels are only about 1/3 of the cost. Even in Germany, the wholesale price of electricity has declined as they built out renewable energy. Taxes account for the higher prices paid by households. Your claims about South Australia electricity costs are simply false and easily Goggled. You need to raise your game if you expect anyone to believe your wild claims. In additon to your points, it is relevant to keep in mind that the price of gas will go up in the future. Since fossil fuels are limited in supply all fossil fuels will go up over the long term. The sun and wind will always be free. The question is will prices go up in a few years or in a few decades? Fracking currently produces a very large amount of cheap gas (and oil) in the USA. The fracking industry loses billions of dollars every year. The fracking industry has never had a money making year. It appears to me that the fracking industry is a giant Ponzi scheme waiting for investors to figure out that they have been had. When investors wise up fracking will stop and prices will substantially increase. Pray that the collapse of fracking will not knock off the economy too. Yes, I cant figure out fracking either. Income flows seems to be hiding underying lack of profitability. Investors must be seeing something I cannot. I hope so because given the amount of money invested, an industry crash could be next financial crisis. It sesems to me that one of the important reasons more renewable energy is not being built yet is institutional inertia. It takes many years to plan, get approval and build a new fossil fuel plant. Nuclear takes even longer. Renewable energy has only been the cheapest option in most areas for 2 or 3 years. Plants planned 5 years ago assumed that renewable energy would be more expensive. No-one anticipated that renewable energy would drop in price so fast. With the new reality that renewable is cheaper many more renewable plants are being planned and built. China and India are proving more flexible than the USA. In addition the utilities have to learn how to use large amounts of renewable energy. Producers of fossil fuels faslsely argue that large amounts of renewable is unreliable. Utilities have to see renewable implemented before they plan large amounts of renewable energy. See Thinkingman's argument. Before countries tried it planners thought over 20% of renewable energy would be hard to regulate. Now they know that they can implement renewable energy without supply issues. Gas peaker plants, already built and currently supplying most peak power, can be used to supply all back up power for renewables on calm nights. In the future renewable energy will be stored so the fossil plants are no longer needed. The prior post discussed why reliable service needs to be considered when selecting sources for electricity. This post discusses the cost of reliable service. Because readers appear to value reasoning, how costs were arrived at is explained. Then, the cost estimates are shown. At present and for the next several years, the lowest cost way to structure reliable service around wind turbines is to supplement them with natural gas fired generators. The latter have lower capital requirements, life cycle costs, technical risks and operating risks than pumped storage, grid scale battery storage and other storage systems. For more information go to https://www.mckinsey.com/search?q=renewable%20electricity . This web site has numerous articles providing insights into conventional and clean electricity systems. McKinsey is a well-respected consulting company. Thus, for this post, wind turbines are combined with natural gas fired generators into an integrated, coherent operating unit that supplies a steady flow of electricity every minute of every hour, every hour of every day and every day of a year. A steady flow system is easier to design and to discuss. Furthermore, a large fraction of the grid’s need is steady. All equipment is assumed to be new and dedicated to the unit. Again, this simplifies discussion. The mix of generating capacity is: Every 100 units of rated wind turbine capacity is supplemented with 50 units of cycling, dispatchable gas fired capacity plus 5 units of gas fired spinning reserves. Cycling, dispatchable gas fired capacity is similar to “gas peaker” capacity (the green line) in the first graph in the SkepticalScience article that started this discussion. The 100/50/5 mix suffices to make big points. Optimization is not necessary. Nor is optimization appropriate here because optimization is site specific. In Texas, this mix will supply about 5,250,000 MWh of reliable electricity per 1000 MW of rated wind turbine capacity. Wind’s share is 61%. Cycling reserves contribute 29%, and spinning reserves contribute 10%. In New England, it will supply about 4,800,000 MWh. The respective shares are 49%, 43% and 8%. A conventional choice for baseload power is a combined cycled combustion turbine fueled with natural gas (CCGT). Per unit of electricity, its CO2 emissions are about half that of a coal fired generator. Its full production costs (capital charges + operating costs) are also lower than coal fired generators. So, this post compares CCGT costs with the reliable wind unit. CCGT fit into the “gas baseload” category (light brown line) on the graph. The graph supports the main, challenged, point of my initial post. The point is: Total production costs for reliable electricity service structured around wind turbines substantially exceed costs for a baseload gas generator. 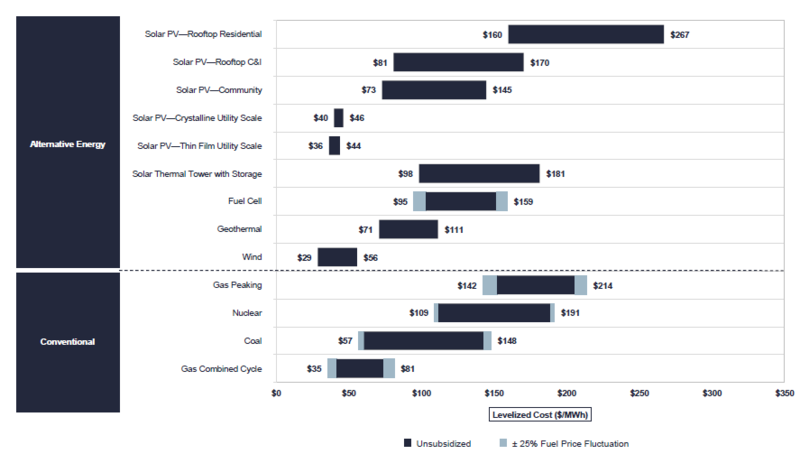 Reliable costs for the former are around $90 per MWh, 1.65x the latter. This is based on TX experience with wind. In New England, reliable cost is In New England, the figures are $112 and 2x. The $90 and $112 estimates are based on 2018 values eyeballed off the graph. Eyeballed values suffice for this discussion. The value for electricity sourced from a gas peaker is $205/MWh, wind turbines $40 and gas baseload (proxy for spinning reserves) $55. The reference point is the center of each line. The values by generator were weighted by each generator’s share of system energy to calculate the reliable wind figure. The shares for TX are .29 for cycling reserves, .61 for wind and .1 for spinning reserves. The arithmetic for TX is: $90 = (.29 * $205 + .61 * $40 + .1 * $55). The shares for New England are respectively, .43, .49 and .08. The arithmetic for New England is: $112 = (.43 * $205 + .49 * $40 + .08 * $55). And yet as I have already stated, wind and solar underbids gas plants. Perhaps if you analyzed the actual bids you could provide more understanding. I am not surprised that you can generate very high cost estimates for renewable energy using unrealistic parameters. For starters, renewable energy does not require 5% spinning reserve and that figure should be completely removed from your calculations. Solar complements wind since it is usually windier at night and sunnier during the day. Wind and solar combinations are cheaper than either alone. Your calculation is a fake product developed by the fossil and nuclear industries to fool the uninformed. Please provide a peer reviewed citation to support your wild claims. "As technology costs fall and environmental concerns grow, renewable-energy systems offer more and more opportunities for incumbents and new entrants alike." These quotes hardly support your wild claims. Jacobson 2018 and Connolly 2015 describe cost effective renewable energy systems that suppply all power for the economy. Coal pollution alone kills over 10,000 people in the USA alone every year and results in over $40 billion in helath care costs. Switching to renewable energy would save all those lives and the cost of the hospitalizations. You and I are the ones who pay for that hospital care. Why would you choose to continue to subsidize the fossil fuel industry by paying for all those health care costs (not to mention the people they kill)? This analysis for Minnesota putting grid storage options cheaper than gas peakers by 2023 if not earlier. "Compared to a simple-cycle gas-fired peaking plant, storage was more cost-effective at meeting Minnesota’s capacity needs beyond 2022." Figure on Pg 38 shows Solar + storage is already cheaper than gas peaker. I suspect however that regional factors are important - availability of wind, solar, existance of conventional hydro etc. I cannot find your calculation on the link you provided. Please link to the page where it exists. This post replies to scaddenp’s misleading comment about South Australia electricity prices and the commonly made claim wind electricity is cheap. Another post will deal with other comments about other points made by me. SOUTH AUSTRALIA ELECTRICITY PRICES— scaddenp moved the goal posts back a few years and to the average for all of Australia. During those years, much has happened in South Australia plus the neighboring states of Victoria and New South Wales to drive up their electricity prices. Specifically, South Australia and New South Wales have closed thermal generators, installed renewables and increased purchases of electricity from Victoria. All three states now pay extraordinarily high prices for electricity. The 27 June 2017 issue of Australia’s ABC (aka Australian Broadcasting Corporation) makes the same point made by the Financial Review article scaddenp disputed. See: https://www.abc.net.au/news/2017-06-28/sa-has-most-expensive-power-prices-in-the-world/8658434 . An Aussie energy services firm shares that assessment. See: https://www.leadingedgeenergy.com.au/highest-electricity-prices-world/ The point is: South Australia’s electricity price became the HIGHEST IN THE WORLD during the second half of 2017. The assessment is based on data from the US Energy Information Administration for electricity prices outside Australia. Domestic sources provided electricity prices for the Australian states. The 18% price increase cited in the Australian Financial Review and ABC articles and elsewhere merely worsened the global rankings of South Australia, Victoria and New South Wales. Their retail electricity prices were already among the 5 highest in the world in early 2017 and during 2016. See pages 12 & 13 of http://cmeaustralia.com.au/wp-content/uploads/2013/09/160708-FINAL-REPORT-OBS-INTERNATIONAL-PRICE-COMPARISON.pdf . The Australian Competition and Consumer Commission echo the assessment that retail electricity prices are higher in South Australia than elsewhere in the world. See p. 26 of https://www.accc.gov.au/system/files/Retail%20Electricity%20Inquiry%20-%20Preliminary%20report%20-%2013%20November%202017.pdf . WIND MUST BE THE CHEAPEST SOURCE OF ELECTRICITY because wind wins power auctions. Wind has lower levelized costs than and gets picked ahead of new natural gas generators and old coal fired generators largely because of preferential treatment by government. Preferential treatments range from “renewable portfolio standards” to loading order regulations favoring wind to production tax credits, investment tax credits, property tax rebates, renewable energy certificates and other forms of assistance. How important are tax credits, tax rebates, renewable energy certificates and other forms of financial assistance? They are vital individually and collectively. The U.S. production tax credit was $23 / MWh in 2015 & 2016. $23 is almost 60% of the levelized cost of wind power shown on the SkepticalScience blog that started this discussion. In the New England region of the U.S., renewable energy certificates were valued at $45-50 / MWh in 2015. $45-50 exceeds the levelized cost. In one of the New England states, Massachusetts, renewable energy certificates exist because “… renewable projects cannot generate enough revenue for private developers to finance the project solely from selling electricity … . Private developers rely on REC sales to the utilities in order to make up the difference.” (source: www.massclimateaction.org/recs ). Maine’s Green Power program buys renewable energy certificates to offset renewables’ cost disadvantage vs. conventional electricity (see: https://www.maine.gov/mpuc/greenpower/faq.shtml ). My town granted a 60% property tax reduction to the wind farm located here. The financial and competitive advantages gained from the above is revealed by the wind lobby’s efforts in 2015 to extend U.S. incentives that were about to expire. The wind lobby pushed to extend incentives even though the investment per unit of capacity had plunged over the 2010-2015 period and further declines were anticipated. [PS] Fixed links (I hope). Please learn how to create links yourself using the link tool (chain icon) in the comments editor. It is simple to do. Thinking man, it would be appreciated if you could format the links so they actually function and can be clicked on. Use the insert tab, the rest is fairly self explanatory. As it stands, I didn't follow your links because I didn't have the patience. It may be that you have a point with the Australian electricity prices but so what? The higher prices reflect the real costs, they are not as artificially low as fossil fuel electricity that relies on higher externalization. Everywhere in the world, we are going to have to get used to higher electricity prices, or pay dearly in other ways. Where I live, we enjoy very low electricity prices due to the abundance of hydropower in our mix. I personally would have no problem absorbing a cost increase of 50 or 75% if it was for the purpose of switching to all or more renewables. That is something I am willing to spend money for, it's worth the cost. I will gladly cut on less important petty consumption to allow for that. Whatever we think we save with cheap power is externalized. It does not go away. It accumulates, compounding interest in that pesky physical world where money is irrelevant. Then the physical world leverages its position, most recently in the disastrous form that has been predicted by climate science. Australia, and Europe, and the US all have experienced record heat, fires, drought and heavy rains on a regular basis in the recent past. Houston saw three 500 year type of rain events in 3 consecutive years; this year's extreme weather in the midwest is adding to the bill; Australia has been burning its summers with fervor several years in a row, while the great barrier is showing signs of stress never seen before. What's the price tag? which is somewhat different from "highest electricity rates in the world". The data is from 2015 except for exclusions noted. So no, I was not moving the posts back several years, and not updated since SA installed the storage battery for instance. Note too that the leading edge energy blog compares 2017 prices in Oz to 2015 prices in rest of world. Furthermore, the prices paid in other countries are converted to AUD at "Purchasing Power Parity", which is a good methodology, but a different basis to that for world electricity comparison in my source. I would say that your industry blog is misrepresenting their data source frankly. I would also say, that if you want to make a case renewables and electricity pricing, then you need to be comparing wholesale generation rates not retail, since retail is affected by many considerations other than the full cost of generating the required power. In your accc.gov reference, I find wholesale cost makes up 31% of the retail price. The report does quite an analysis of change in wholesale price. Retirement of coal plants and slow development of new capacity certainly do figure but SA is also particularly vunerable to gas price. Market issues around concentration and gaming the system were also identified. And dont forget that FF is also subsidized.